A Russian Proton rocket is set for launch Sunday with a 6.6-ton spacecraft to buttress Sirius XM Radio's fleet of satellites transmitting music, news and entertainment programming across North America. The commercial launch, managed by U.S.-based International Launch Services, is set to take off at 1812:56 GMT (2:12:56 p.m. EDT) from the Baikonur Cosmodrome in Kazakhstan. Russian technicians rolled the 191-foot-long rocket to launch pad 39 at Baikonur on Thursday. 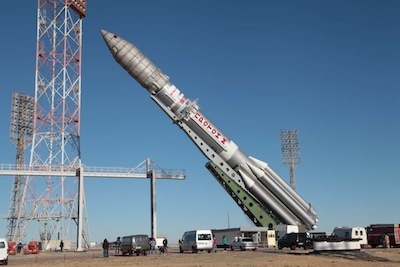 Ground crews will oversee loading of the Proton rocket with hydrazine and nitrogen tetroxide propellants Sunday, then turn over control of the final moments of the countdown to a computer-run sequencer. The rocket's six first stage RD-276 engines, firing at full throttle to produce 2.5 million pounds of thrust, will propel the launcher into the upper atmosphere, yielding to two more liquid-fueled stages as the Proton races east over Central Asia. Built by Khrunichev State Research and Production Space Center in Moscow, the three-stage Proton will put the mission's Breeze M upper stage and the Sirius FM6 satellite on a ballistic trajectory just shy of the velocity required to achieve Earth orbit. The Breeze M main engine will ignite at T+plus 11 minutes, 46 seconds, to reach a low-altitude parking orbit. Four additional Breeze M engine firings will adjust the rocket's orbit over the next 9 hours. The burns are designed to raise the vehicle's altitude and move its orbit closer to the equator, reducing the work the Sirius FM6 satellite will need to do over the following weeks to arrive in an operational position 22,300 miles over the equator. The Breeze M is scheduled to release the 13,234-pound Sirius FM6 spacecraft at 0324 GMT Monday (11:24 p.m. EDT Sunday) into an orbit with a peak altitude of 22,236 miles, a low point of 2,563 miles and an inclination of 23.18 degrees. Over the next few days, Sirius FM6 will fire its own engine and climb into a circular orbit over the equator, where its speed will match the rate of Earth's rotation, making the satellite appear at a fixed point in the sky. Built in Palo Alto, Calif., by Space Systems/Loral, Sirius FM6 will be stationed at 116 degrees west longitude. The satellite is based on Loral's 1300 spacecraft platform. Loral says Sirius FM6 is one of the most powerful satellites available today. Its solar panels are expected to generate almost 20 kilowatts of power at the end of the spacecraft's 15-year service life. Officials delayed Sirius FM6's launch from early 2012 to allow for inspections of the satellite's solar array deployment mechanism to ensure the craft is immune from glitches that struck other Loral satellites. Sirius FM6 will reach more than 25 million subscribers to New York-based Sirius XM Radio's lineup of informational and entertainment programming. The new satellite will be the 10th spacecraft in the company's fleet, which reaches customers in the United States and Canada. 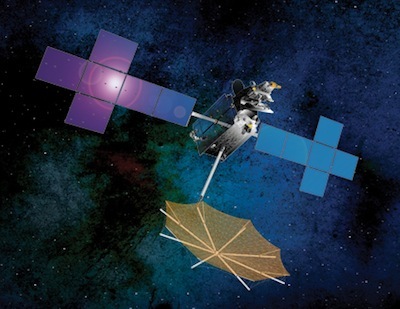 The Sirius FM6 mission continues a steady cadence of Proton launches after the venerable rocket's return-to-flight mission Sept. 29, which sent the ASTRA 2E communications satellite into orbit for SES of Luxembourg.